PrestaShop shows the tax included price or the tax excluded price according to your site settings. 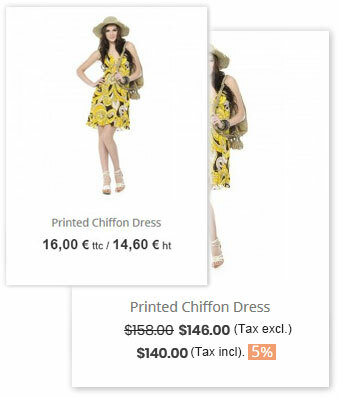 With this second price PrestaShop module, both the tax included price and the tax excluded price can be shown out at the same time on the product page, product listing pages and homepage. Demo 1 is running on PrestaShop 1.7 + Classic theme, First prices, second prices, old prices, tax labels and discounts are all displayed by this module. Demo 2 is running on PrestaShop 1.7 + Transformer theme, First prices and tax labels for first price are displayed by PrestaShop, Second prices, tax labels for second price and older price are displayed by this module. Display the second price on your site. If you set to display the tax included price on your site, then this module will show the tax excluded price out, vice versa. Refer to #1 in the documentation section. Show the second price when a tax is applied. In some cases, tax won’t be applied to customers from certain countries/states, this option is used to avoid two same prices showing out for customers from those countries/states. Multi-language support. You can translate “Tax included” and “Tax excluded” on the module’s configuration page, easier that using the PrestaShop’s translation system. Possibility to adjust the position of second price. You change adjust the position of second price within those hooks. The latest version of Transformer theme and Panda theme have all of those hooks, but other themes may just have some of them, for example the Classic theme just have four of them on the product listing pages. But that doesn’t matter much, as long as there is one available, this module can work. Where are those hooks located depends on your theme. Possibility to show the second price on the main section of produce page only. On the main section of product page. On all other blocks which have displayProductPriceBlock block. You can use custom css code to show the second price on certain blocks. An option to use this second price module to show out the first price. 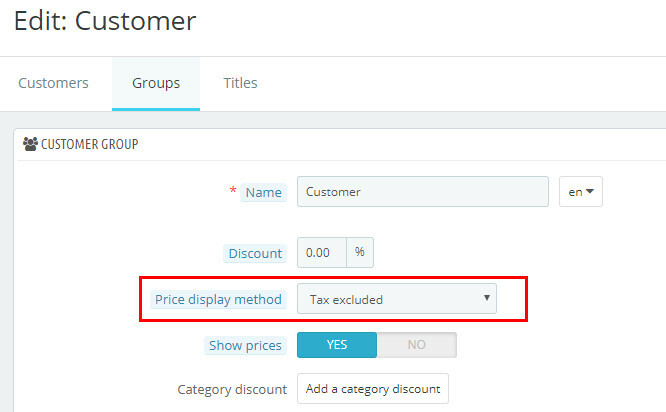 If your theme doesn’t have a option to show tax label, or if you can’t make the first price & the second price be along with each other because of the location of displayProductPriceBlock hook. Then this option would be quite useful, because of the first price and the second price are both displayed by this module, you can manage them easily. These options are available for Second prices, Tax labels and First prices(The ones displayed by this module). The default first price is supposed to be managed by your theme, you can use csutom css code to change it. A separator to separate first price and second price. This Second price PrestaShop module can be installed easily without editing any files. 1. What’s the first price and what’s the second price? There are two “first price”s. The default first price, it’s the price displayed by PrestaShop. The another first price is displayed by this module. Don’t be confused, because of if your theme doesn’t provide options to manage the default first price, then you can’t customized it. The solution we figured out for that case is using this module to display the first price, hide the one displayed by PrestaShop, then you will be able to customize the first price. If you set to display tax included price on your site, then the second price will be tax excluded price. 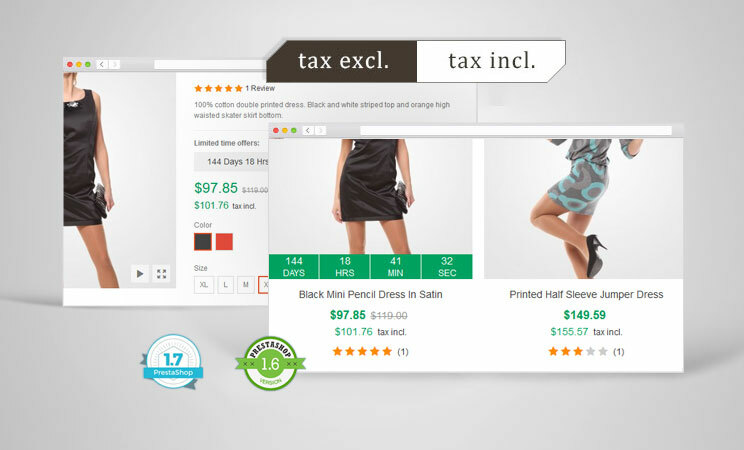 If you set to display tax excluded price on your site, then the second price will be tax included price. 2. How to set to show tax included price as first price, tax excluded price as second price? For 1.7 users, go to the “BO > Shop parameters > Customer settings > Groups” page. For 1.6 and thirtybees users, go to the “BO > Customers > Groups” page. To change the “Price display method” setting for every customer group. 3. How to display tax label for the default first price in PrestaShop 1.7? 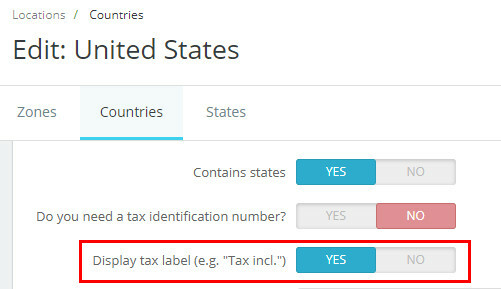 PrestaShop 1.7 has a native feature for that, you just need to enable the “Display tax label” setting for countries. 4. Why the second price doesn’t show out? Check the “Enable tax” option to see if it’s enabled on the “BO>International>Taxes” page. For 1.6 and thirtybees users, check on the “BO>Localization>Taxes” page. Check your taxes and tax rules, make sure they are configured correctly. Check the “Tax rule” option on the product configuration page. 5. How to show tax included and tax excluded total prices on shopping cart page and checkout page in PrestaShop 1.7? For transformer theme and panda theme users, we added an option for than in the Theme editor module in Transformer theme v4.3.0, Panda theme v2.4.0. 6. How to translate tax labels? You can translate “Tax included” and “Tax excluded” on the module’s configuration page. 7. A trick to make the first price and the second price displaying in two lines when they are both displayed by this second price module. Put this code to the separator field. Added compatibility with PrestaShop 1.7.5.0.